Nepal is a South Asian country that borders several countries. A view of mountain peaks on the Tibet-Nepal border. Nepal borders Tibet (autonomous province of China) and India. 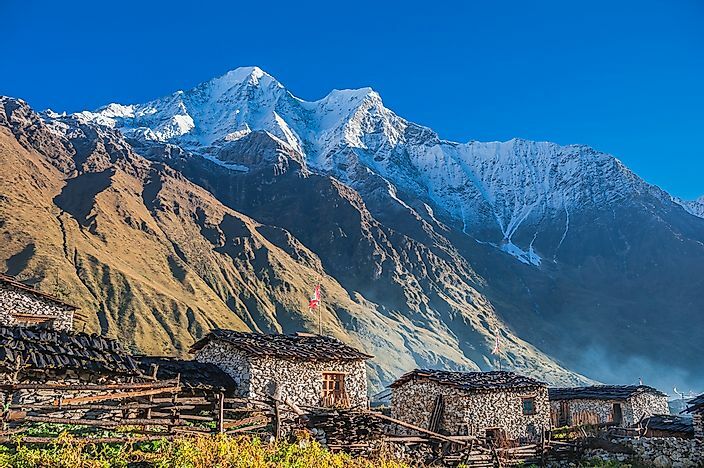 Nepal's total area is approximately 56,827 square miles and the capital is Kathmandu. The country is divided into seven states and 77 administrative districts. Nepal is multi-ethnic, multi-religious, and multilingual country and the most spoken language is Nepali among other languages. The border between Tibet and Nepal was established in the 18th century, and the region was formally recognized as an autonomous province of China in 1965. The total land size of Tibet is approximately 965,000 square miles which is only second to Xinjiang Uygur autonomous region. The China-Nepal border is 768 miles long, and the Himalayas mountain range extending from North West to south-west direction separates the Tibet autonomous region from Nepal. The borderline also passes through Mount Everest. Six ports of entry were opened between China and Nepal borders in 2012. The border crossing points between the two countries exist at Zhanguru and kodari, and in 2014 another border crossing point was opened at Rusuwa to facilitate free movement between the two countries. A close relationship between India and Nepal was initiated in 1950, after the signing of Indo-Nepal treaty of peace and friendship. Nepal and India borders are open, and the citizen of the two countries can move freely across the borders without restrictions and may work in either of the countries. Previously, Nepal and India had a long-standing border dispute dating back to 1814 after Nepal was defeated by the British, and Nepal lost Darjeeling and Kumaon to the British. Mechi and Mahakali rivers were set as the new boundaries, but due to lack of precise definition of the exact tributaries and source of the two rivers, a border dispute erupted which has not been resolved to this date. The main disputed territories include Kapalani in the west and Susta in the south. The designated border crossing point between the two countries is Jogbani, Uttar Pradesh, Sunauli, and Rupaidiha. Internationally, Nepal has strong bilateral and multilateral relations with major world economic powers and international organizations. Countries like the US and UK provide Nepal with economic and military support. Regionally Nepal has maintained good bilateral relations with most of its neighbors.